IHA is happy to announce that it co-produced the first exhibition of the Cercle d'Art des Travailleurs de Plantation Congolaise (Congolese Plantation Workers’ Art League or CATPC) in the United States. Many of the sculptures created by CATPC members are future, current, and ancestral self-representations, that represent symbolic figures such as an art collector. 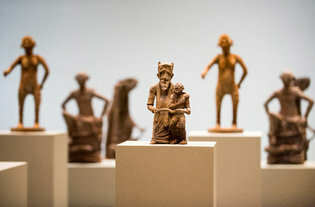 First molded from clay, before being 3D printed and cast in chocolate, the sculptures are made in collaborative settings and the materials used refer back to, and overwrite the exploitative economics of global trade. The CATPC reinvests the profits into new, self-owned, and regulated agricultural production – provoking questions regarding the division between those who should work on plantations, and those who are allowed to reflect on that; about the inherent value of art and its market, and challenging art's potential as a tool for broader social change. The Cercle d'Art des Travailleurs de Plantation Congolaise (CATPC) is an expanding art collective co-founded in 2014 in the Democratic Republic of Congo. Plantation workers Djonga Bismar, Mathieu Kilapi Kasiama, Cedrick Tamasala, Mbuku Kimpala, Mananga Kibuila, Jérémie Mabiala, Emery Mohamba, and Thomas Leba, ecologist René Ngongo, and the Kinshasa-based artists Michel Ekeba, Eléonore Hellio, and Mega Mingiedi are its leading figures.